Piero Taruffi was born in Rome in October 1906. He won his first race on two wheels at the age of 19 years and continued to achieve another twenty two wins out of forty one starts. Among these were the 1928 Royal GP of Rome on a Norton 500. As well as racing, he broke a total of thirty eight world records. His record on four wheels is even greater with forty four wins in one hundred and thirty six races, including sharing with Stirling Moss, Jean Behra and Harry Schell to take the 100K at the Nürburgring and also the 1957 Mille Miglia. At various times he was a member of the Ferrari, Maserati, Bugatti, Alfa Romeo, Lancia and Mercedes works teams. Off the circuit, Taruffi was technical director for Gilera prior to the war and Racing Director for Cisitalia post war before returning to Gilera. In 1958, he published "The Technique of Motor Racing" still the definitive work on the skills and abilities required to successfully race cars. Piero Taruffi died in 1988. Not exactly a regular, in fact Piero only drove a 500 once, at Brands Hatch in May 1951 but an amusing aside. Taruffi had constructed the twin-torpedo Tarf Gilera in 1948 for record attempts and was very interested in the technical aspects of driving so a small motorcycle engined car that out handled the GP cars would undoubtedly interest him. One of the Coopers, probably John, was a huge fan. Quite how the idea of a race came about is unclear but Raymond Sommer had already "tried-and-buyed" and Coopers were making an impression on the continent. A Cooper Mk V was provided by Charles Cooper and Piero finished third in his heat of the Open Challenge Race and fourth in his heat for the International Trophy. Very respectable performances for a newcomer to 500cc racing, in a quality field, which included Don Parker, Alan Brown, Eric Brandon and Bernie Ecclestone. Taruffi was also down to drive two days later in the International Trophy at Goodwood. Probably in John Cooper's car. The blazer boys of the BARC decided that having never driven at the circuit, and failing to complete his mandatory rookie laps, Taruffi was not experienced enough to race so that was that! In October 1953, Piero used the twin boom Tarf-Gilera to set a series of 500cc Class I records. Unfortunately for him, Arnott's record attempts at Montlhéry were delayed until the end of the month so both Piero's and John Cooper's records were short lived. Beyond his driving he had a Doctorate of Industrial Engineering and his technical appointments in the motor industry are no less formidable than his successes in the sporting side. He was racing manager and on the engineering staff of the C.N.A. 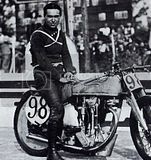 Rondine concern from 1935-1937, and technical and racing manager for Gilera in 1937-1940. In 1946 and 1947 he was racing director, technical consultant, and Chief Tester to Cisitalia and in 1950 rejoined Gilera as racing manager and technical consultant until 1956. From this vast wealth of experience Piero Taruffi crowned his career with the authorship of his famous book, The Technique of Motor Racing, which ranks as a standard work of reference to the sport of motor racing. Piero Taruffi passed away at the age of 81 in 1988 PieroTaruffi " the Silver Fox" reached the top of motor sport on 2 and 4 wheels in the 30s and 50s. He also managed famous teams, was a brilliant engineer and a world record breaker on 2 and 4 wheels. He established 53 international motorcycle records and all 39 car records were set up in a revolutionary twin boom machine of his own design and construction. The Technique of Motor Racing" by Piero Taruffi, foreword by Juan Manuel Fangio, translated from the Italian by D.B. Tubb, 1961 3rd impression, published by Robert Bentley, hardcover with dust wrapper, 125 pages, 10" x 7 1/2", well illustrated with photos, charts and diagrams in b&w. "Trained as both a racing driver and an industrial engineer, Taruffi provides a unique perspective on the art and science of motor racing. He drove for the work teams of Ferrari, Maserati, Alfa Romeo, Mercedes-Benz , and others, in a career that spanned over 25 years and was crowned by his victory in the 1957 Mille Miglia." "The Technique of Motor Racing" was republished as recently as 2003 having become the standard by which other driving texts are measured .